1) Can you save my company time and money? YES! More times than not Pro Mailing Systems can prepare, and deliver to the post office for less than what your company or organization would pay your employees or helpers to do the same job. With the discounted postage we offer you by using our bulk mailing permit, we can do all the work stated above, thus saving you time, and including postage still be under 37 cents a letter, thus saving you money. 2) What is the minimum number of pieces that I need to mail to qualify for standard presorted or bulk rates? The USPS requires a minimum of 200 mailing pieces for bulk or presorted standard mail & 500 mail pieces for presorted 1st class mail. 3) Do I need a permit? You are welcome to use our permit for no charge as long as we perform the mailing services for your mailing project. Call or email us for simple instructions of obtaining and printing the permit on your mail piece. We will need to see proof of the mailing panel the permit is printed on before it goes to the commercial printer. You can obtain your own bulk mailing permit from the USPS. The annual cost is about $150 for the permit, and another $150, one time fee, for permit imprint (the ability to print the permit directly on the mail piece). You would most likely have to mail out about 5,000 pieces of mail a year, plus learn all the rules and regulations of the postal system for it to be cost effective. Pro Mailing has all the permits and knows all the rules which we use to savings on to you! 4) Do you ship or package via the United Parcel System (UPS) or FedEx? Pro Mailing Systems does not offer these services. Our main focus is on the bulk mailing portion of the industry. 5) Do you do printing and/or graphic design at your location? At this time Pro Mailing Systems does not offer printing and design. However we work closely with many local printers. We can help you find one that meets your needs and help with the design to ensure that your mail piece meets all the USPS automation qualifications to save you money on postage. Usually you can just drop your print job off at the printer, and when it is ready, we can arrange to pick it up or have it delivered to our shop. This makes it just one stop and drop for you. 6) How much space do I need to leave you for addressing? The ideal addressing area would be 2" tall by 4" wide. However, we can work with a minimum area of 1 ½" tall by 3 ¾" wide. 7) What is the difference between a letter size piece or a flat. Standard mail is classified as either as a letter sized piece or a flat. Letter rate postage is lower because the Postal service can process this type more efficiently. Also, letter size pieces usually lend themselves to automation compatibility more so than non-letter size pieces. By switching your mail piece from a non-letter to a letter, your mailing can save from $0.015 - $0.05 per piece dependent on the piece and rate qualification. In other words, reducing your dimensions will lower your postage costs! Maximum - 6 1/8" x 11 ½"; cannot be thicker than ¼"
*The aspect ratio (length divided by height) should be more than 1.3 or less than 2.5. Maximum - 12" x 15"; cannot be thicker than ¾"
8) Should I use a staple to close my mail piece? Even though the USPS lets staples through the mail, it is highly unadvisable to use staples to close your mail piece. It can slow down sorting and delivery, the mail piece would become non-automated and cost more to process. 9) What is the largest postcard size? For 1st Class Mail, it is a 4 ¼" x 6"; for Presorted Standard it is 6 1/8" x 11 ½ "
10) Would I save money if I prepared my own labels and gave them to you to affix to the mail piece? Believe it or not, but if we prepare your list with our postal software, which sorts and adds barcodes to the address for speedy delivery, we can prepare and affix the labels for about the same cost it would be if you brought us the labels already prepared. 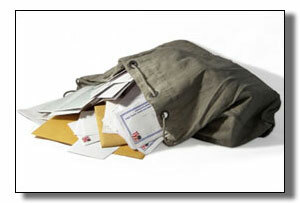 Pro Mailing Systems is aimed at saving you time and money. Just send us your client database and let us do the work. 11) What formats can I send my database to you in? We prefer that your database be in Excel, Text Delimited or a Comma Delimited format. Other formats can often be used; however please contact us if you have another format to ensure compatibility. You can rest assured that your privileged client information will be safeguarded and protected when in our care. Just consider Pro Mailing Systems as an extension of your company!